Redcurrants ripen from mid to late summer. 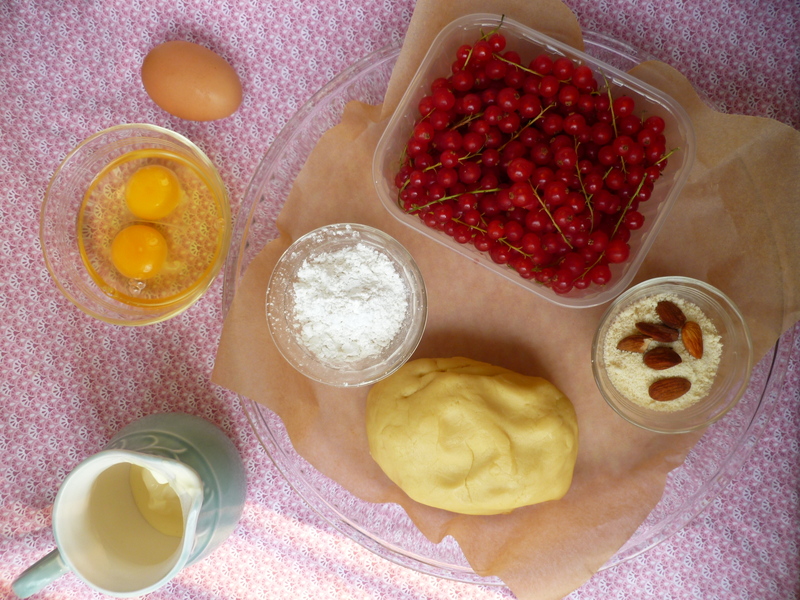 The diplomatickitchen briefly sets aside the menu of recipes for Mixing Dinner and Business to accommodate the redcurrant’s brief seasonal schedule and present this recipe for them while the fruit is in the markets. There are repetitive kitchen activities which many cooks enjoy for their sameness. Their minds wander and think of other things as their hands perform, over and again, some familiar action. Shelling peas, for instance, is a mechanical task equally compatible with solitary rumination and a companionable hour with a fellow sheller …and so is seeding currants–which is the first step toward baking this tart of pretty fresh fruit which, like the Last Rose of Summer, will not remain when the summer’s gone. 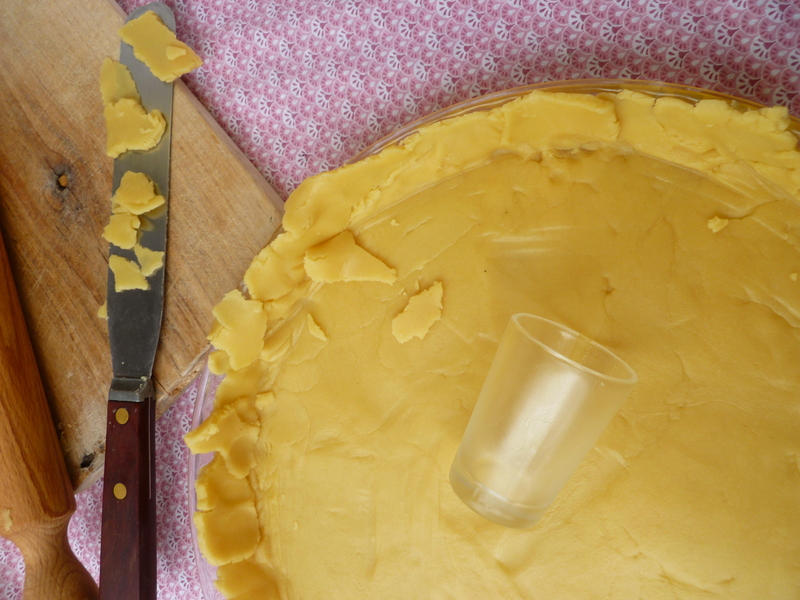 Ingredients for the Shortbread Crust: Measurements are given in metric units and the closest American equivalent measures. Optional: about 1 cup of Heavy Cream, lightly sweetened and whipped… Or, if the cream is very thick, there’s no need to whip it. 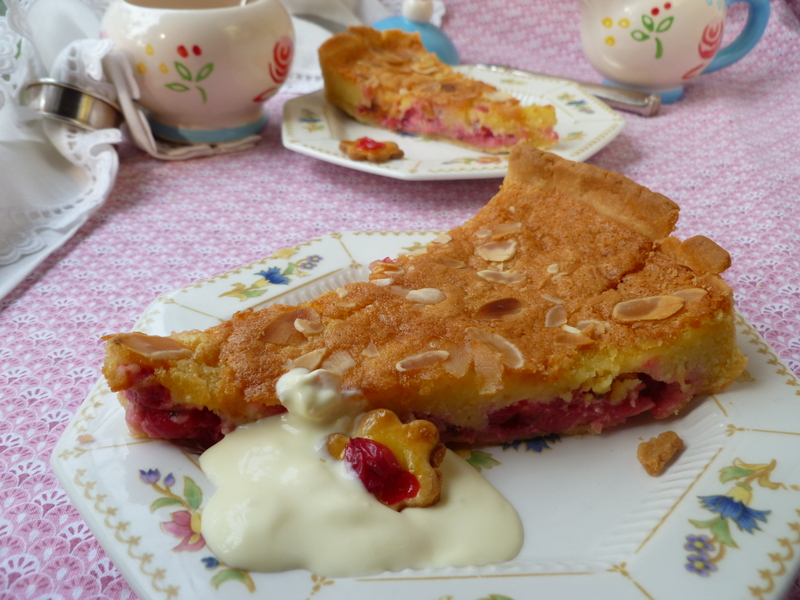 Place a spoonful beside each slice of tart. 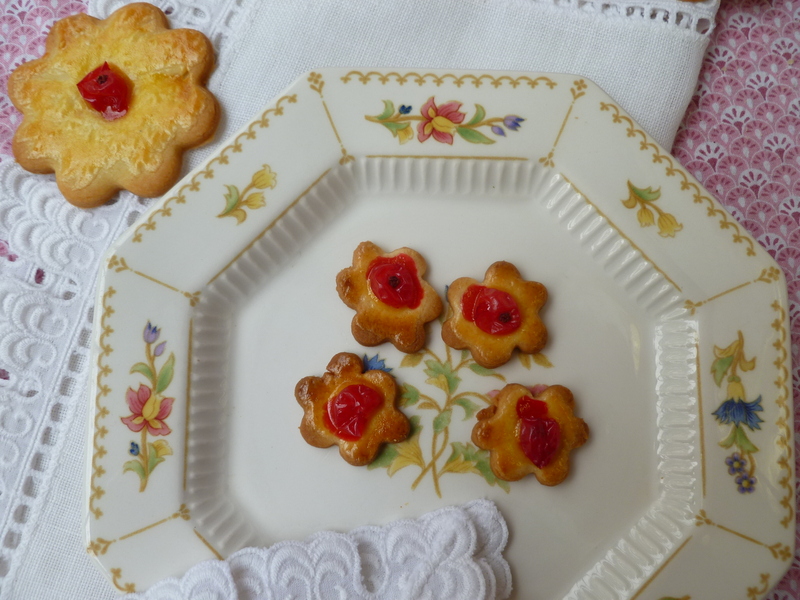 The cream in the photos is slightly sweetened and unwhipped. 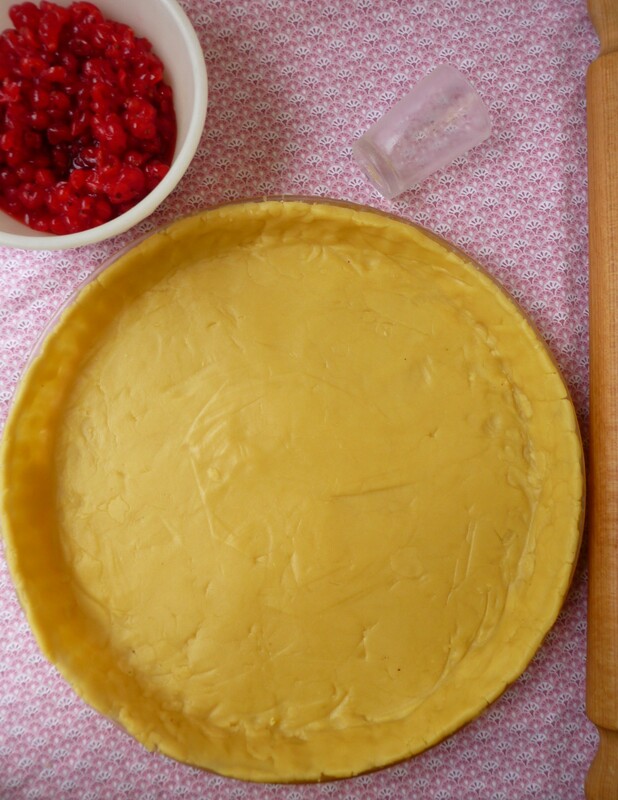 Ingredients for the Tart Filling: Measurements are given in metric units and the closest American equivalent measures. 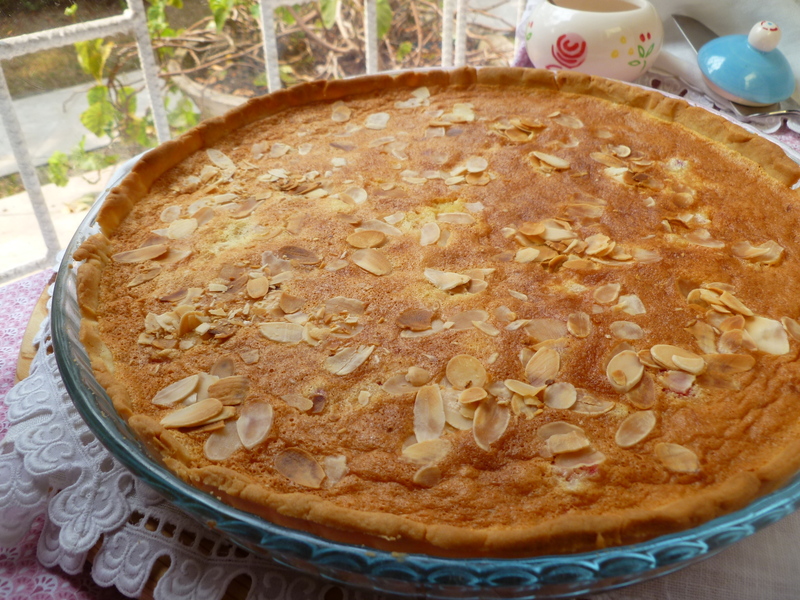 a straight-sided Tart Pan: The one used for the photographed tart measures 12-inches across the top, 11-inches across the base and is 1-inch deep. 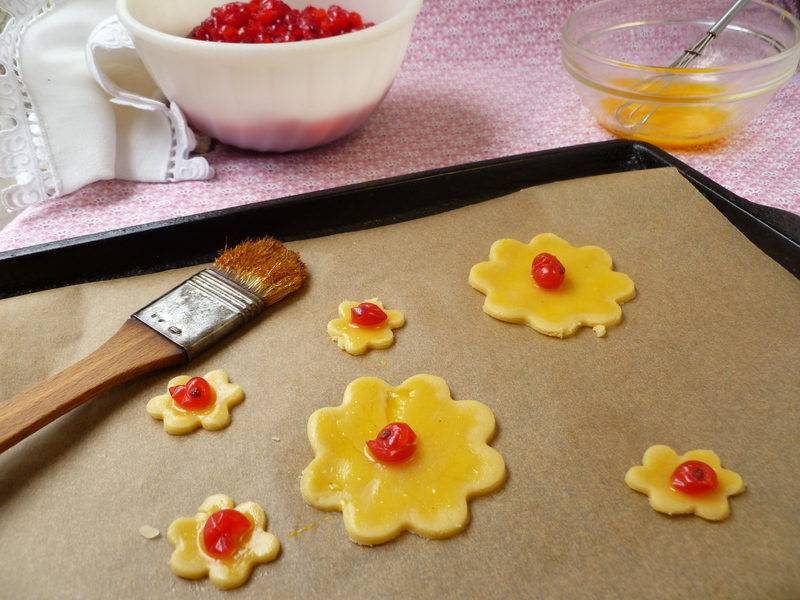 A Note: Ingredients, Equipment and Recipe for the Last Touch: Shortbread Pastry Flowers with Redcurrant Centers are printed below at the end of the tart recipe. 1. Put the flour, bits of cold butter and powdered sugar in the bowl of the processor and mix them together so that the butter is cut into the flour and sugar. The mixture will have a ‘meal-ey’ texture. 2. Turn the processor back on and pour the egg yolk through the tube. Process until the mixture starts to come together and forms a big ball with small clumps of dough around it. 4. 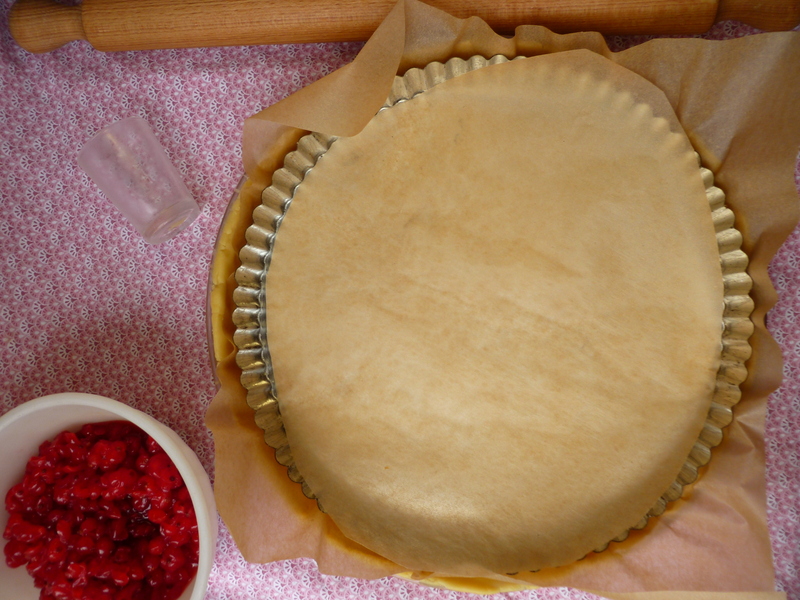 Preheat the oven to 350 F. Flour the pastry board and roll the dough into a circle large enough to cover the bottom and sides of the tart pan. 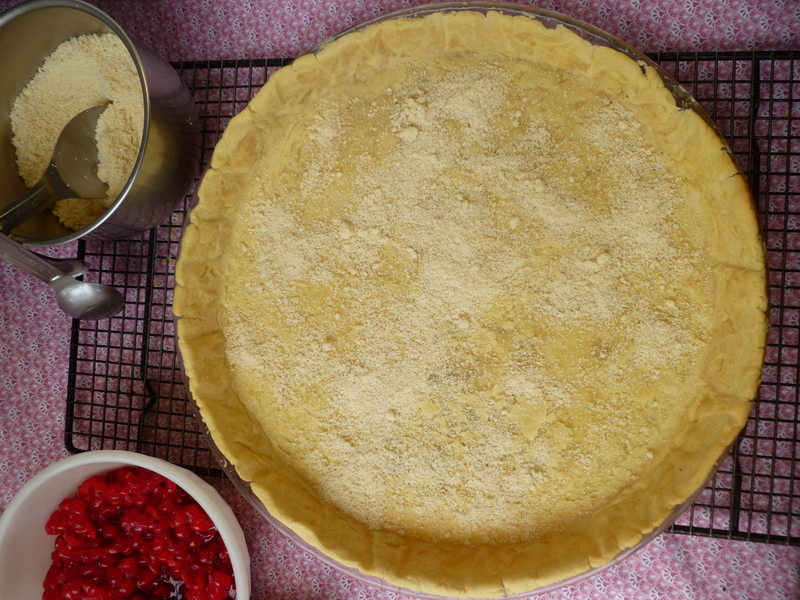 The shortbread crust is crumbly and cannot be transferred to the pan in one piece like a pie crust. 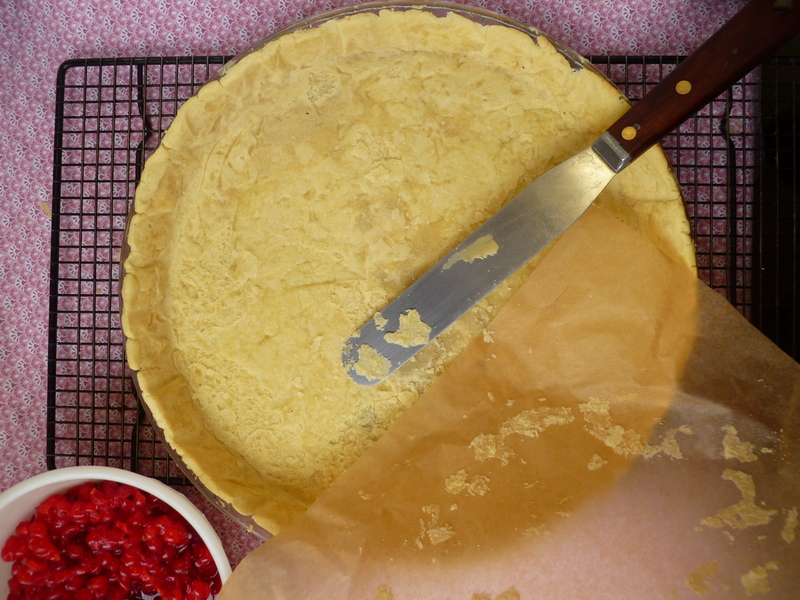 Cut the dough in sections and transfer them to the pan with a spatula. Place them around over the base and the sides. II. 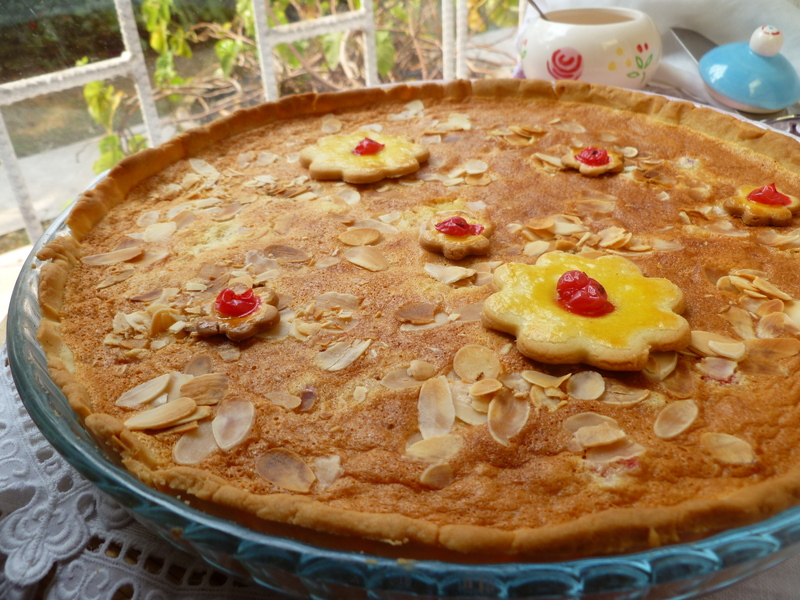 Putting the Tart Together and Baking it: The tart bakes in an oven heated to 350 F. The oven is already preheated to this temperature for blind baking the crust and baking the optional Shortbread Flowers. 2. Beat the eggs and sugar together until they are thick and white-ish yellow in color. Beat in the remaining ground almonds and then, beat in the cream. 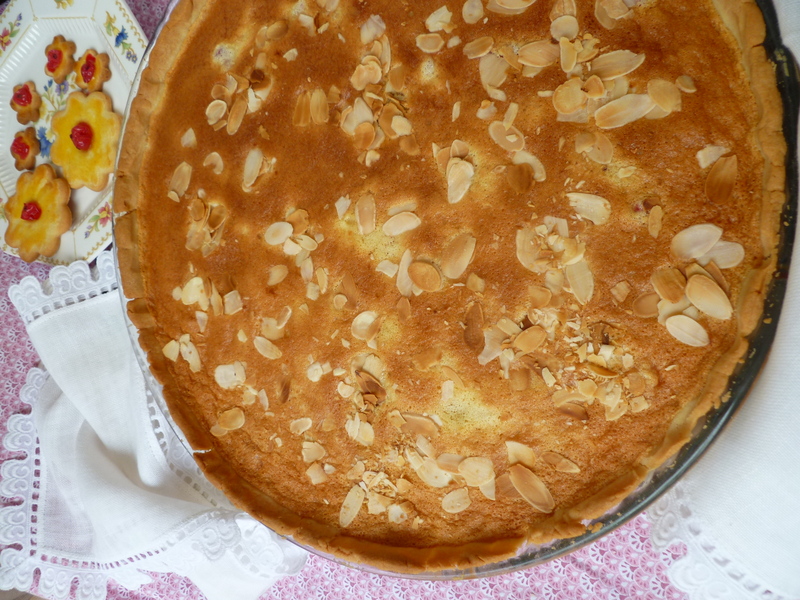 ….and sprinkle the thin-sliced toasted almonds over the batter. 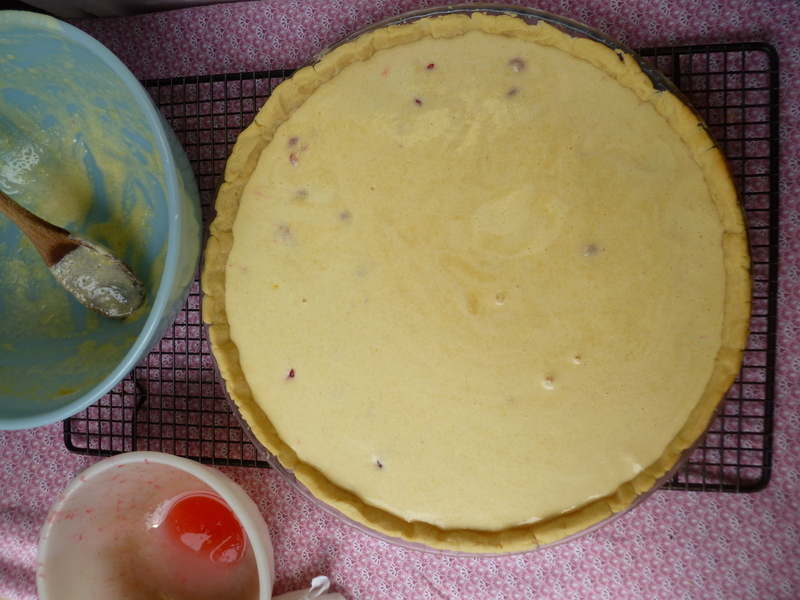 …Let the tart sit for 20 minutes. It is good served warm…or cooled. 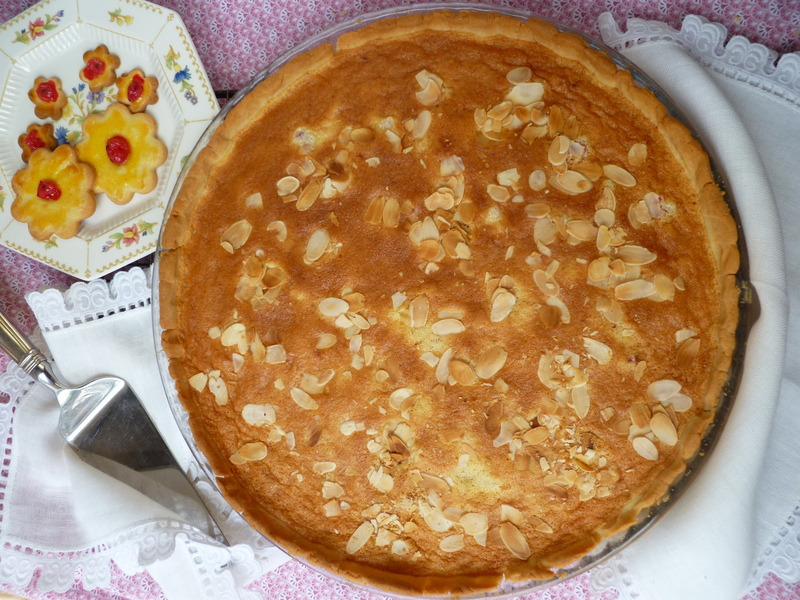 A spoonful of slightly sweetened whipped or very thick unwhipped cream goes well with this tart, and the Shortbread Flowers make a pretty optional decoration. 2. 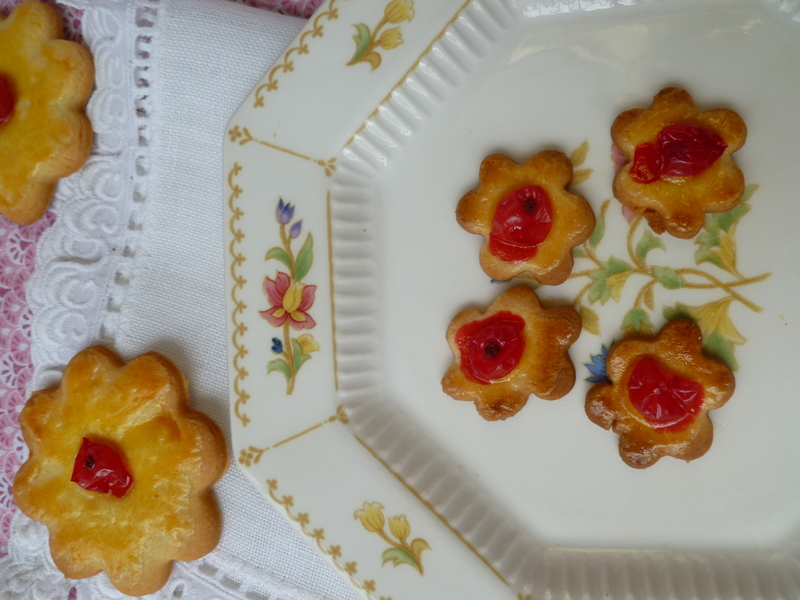 Collect the leftover pieces of pastry into a ball, roll them out and cut flowers or whatever shape you like with a cookie cutter. 4. Transfer them to a rack to cool. 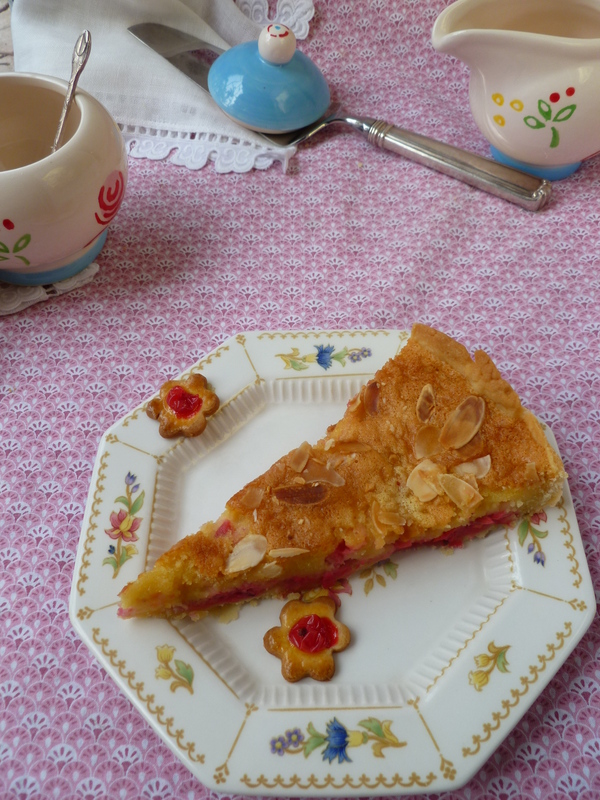 A Note: Fresh Redcurrant Tart with Shortbread Crust is part of the Occasional Menu: Helga’s Cake and Coffee Party. 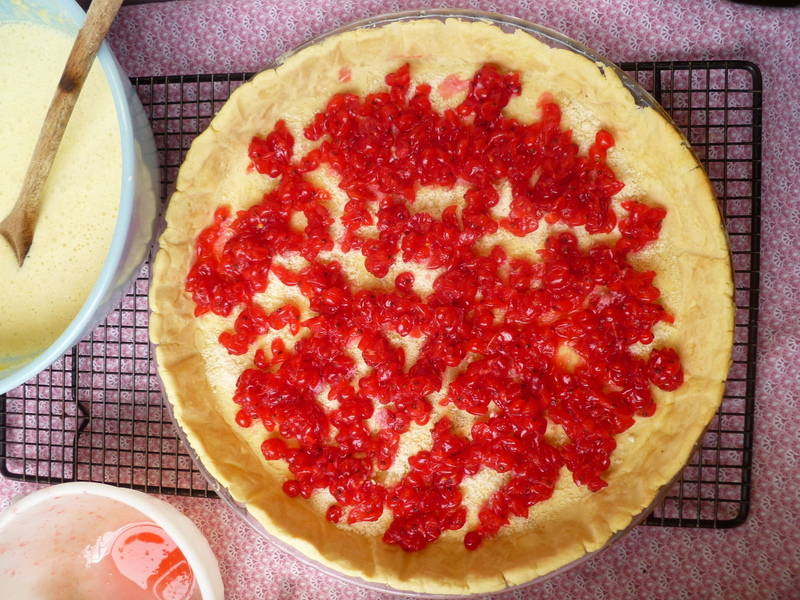 Acknowledgements: The dk version of Fresh Redcurrant Tart with Shortbread Crust draws upon and revises a shortcrust recipe from the food blog deliciousdays, and adapts a filling from a recipe for Tarte Groseilles et Amande from another food blog Les délices d’Hélène. 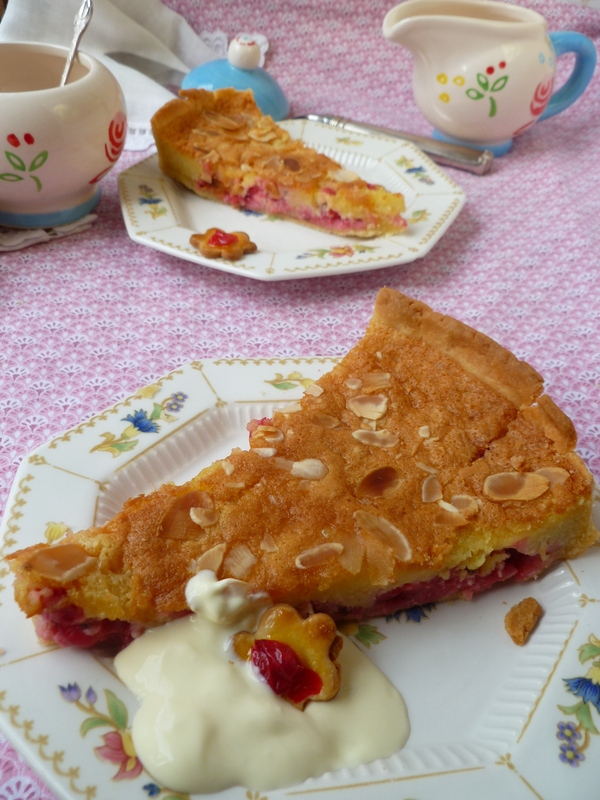 Also,…thanks to Naomi Laeuchli for whiling away the evening hours with her mother, talking of many things and seeding little redcurrants to make a tart.